'Tis the Season! 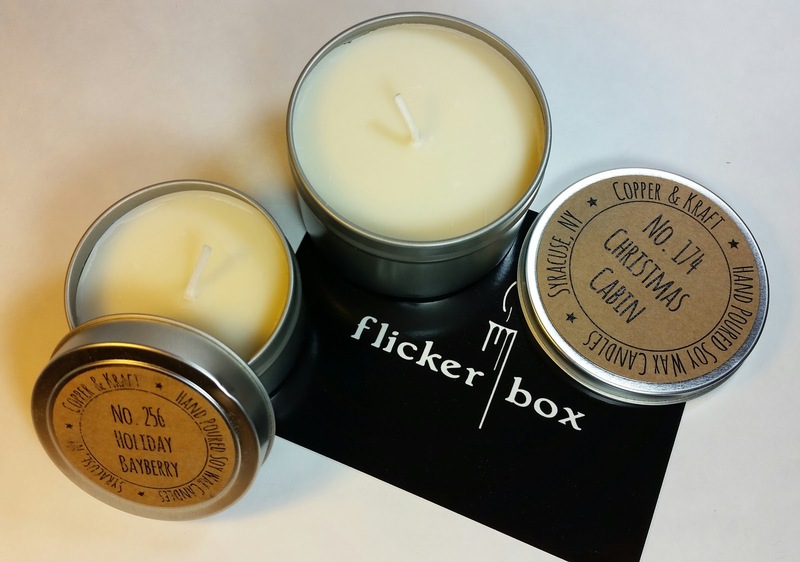 And the December 2014 Flicker Box is here to make your home smell good even if you aren't baking and you don't have a real Christmas tree! I've been really enjoying my Flicker Boxes. I got a three month subscription on Gilt City which makes my boxes $21/month. The kinds of candles I've gotten so far have been marvelous! 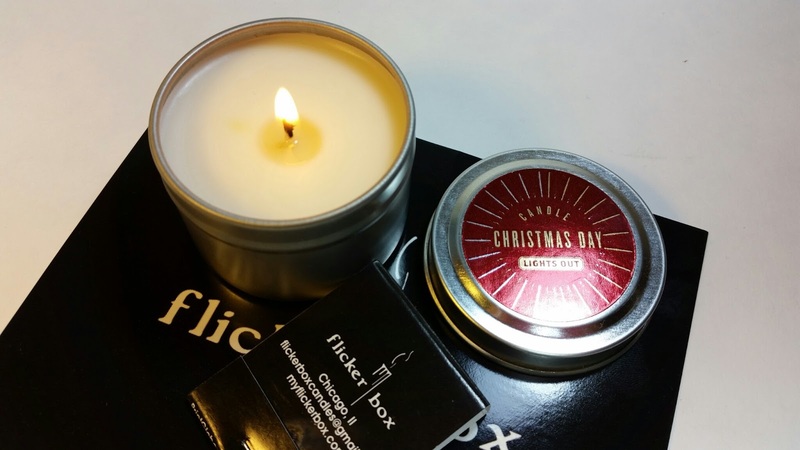 Lights Out Candles in Christmas Day- A 2oz soy tin that smells of holiday baking with a hint of cinnamon. It has a burn time of 15 hours and is subtly sweet. This smells amazing! It doesn't have the best throw but I have it on my desk and I just need to smell it here. Mmm! 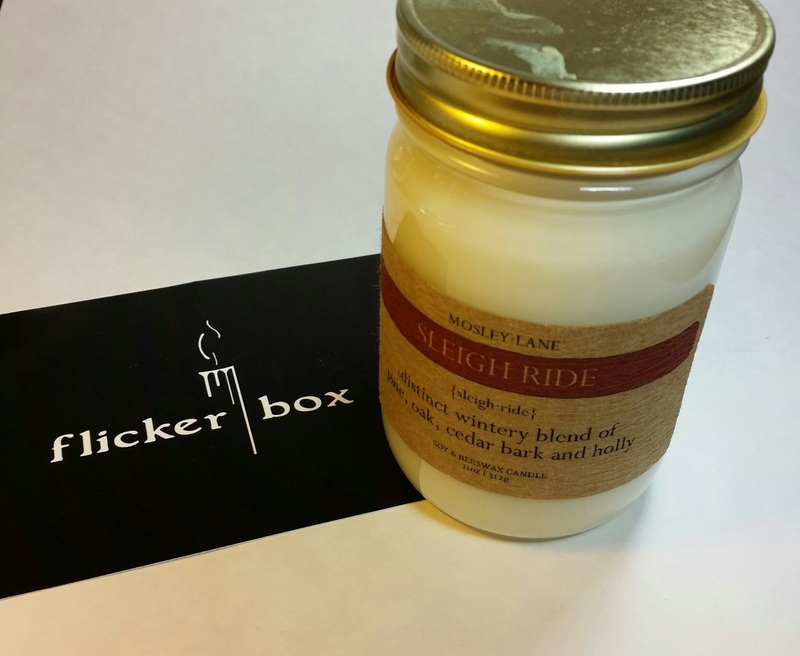 Mosley Lane Sleigh Ride Mason Jar Candle- This is big 11oz jar candle with a whopping 50 hour burn time. It is made with a blend of soy wax and beeswax for a long lasting, delicious aroma of pine, oak, cedar bark and holly. I'm putting this next to my tree. It smells like all the Christmas in one jar! 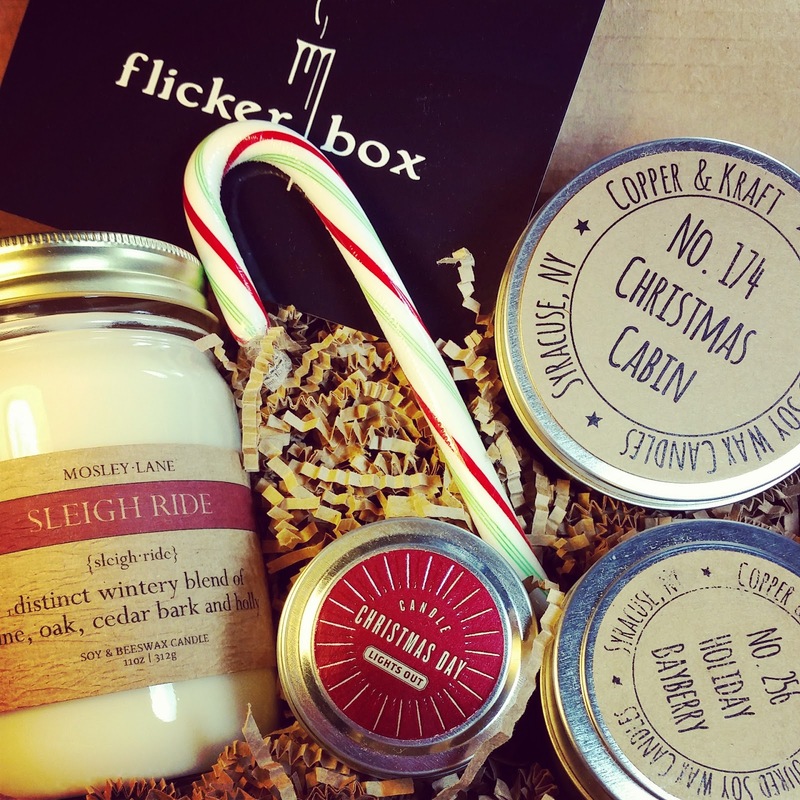 VERDICT: Flicker Box has such perfect selections for the holidays! I love them all and have already started burning them. I'm very impressed with Copper and Kraft. I love the spicy pine bite of the Mosley Lanes Sleigh Ride and the softer fir and bayberry scents of the Copper and Kraft Holiday Bayberry. Two excellent greenery scents that perfectly complement Christmas. Then there are the two baking scents. The drool worthy cinnamon deliciousness of the Christmas Cabin from Copper and Kraft and the soothing Lights Out Christmas Day that smells like baking pie and cider. All great scents with long lasting burn times! The value was definitely there for me with a retail value of nearly $40. Flicker Box always promises that you'll get a value of at least what you've paid for the box and this time it exceeded the regular monthly cost which is good. With handmade candles, you'll be hard-pressed to find a candle subscription this good, with this much variety and with such careful curation. Love! If you'd like to sign up for Flicker Box, you can do that right here. There are several subscription choices, including every other month. I just checked out the Copper and Kraft Etsy and I am sold! Blueberry cheesecake? Frosted sugar plums? I die.